Wealthy atheist organizations have long dedicated themselves to prowling about the nation, searching every tiny county and small city, looking for any religious symbology that they can throw millions of dollars into having removed for no reason. Often they pick on one-horse towns in the South, in communities that are almost entirely Christian, and then they attempt to impose their secular atheist religion on the faithful folks who live there. These communities have a character that reflects the values of multiple generations of its inhabitants, and this very much bothers these atheist groups. Funny, usually liberal secularists are the ones who justify all manner of things — including infanticide — by saying ‘hey, this doesn’t concern you and it doesn’t personally affect you, so you should mind your own damn business.’ Apparently that logic applies to baby murder, but not to a small granite cross outside town hall in Podunk, Alabama. Usually they get their way because they have more money and a lot of time on their hands. While Christian groups actually help the poor and serve humanity, atheist organizations dedicate millions to tearing down Ten Commandment slabs from courthouses in the Bible Belt. (Of course edicts like “Thou shalt not kill” and “Thou shalt not steal” are highly offensive and have no business anywhere near a courtroom!) Sometimes, however, they pivot strategies. Take the case of Bradford County, Florida. For years, atheist groups from out of state have tried to force local officials to remove the Ten Commandments from the court house lawn. For years, they’ve failed. Finally they decided to give up, and apparently abandon their entire legal argument against the display, instead opting to build their own atheist monument “in response to” the Biblical monument. The project was of course funded with money from far outside Bradford County. Their Atheistic Tribute went up last week to much fanfare. Some Christians opposed the display on the grounds that, unlike the Ten Commandments, it doesn’t reflect the wishes of the local community, but the cynical agenda of monied powers from up north. Of course they’re correct in this assessment, but I think they’re looking at this the wrong way. Personally, I embrace the atheist monument. I hope they build one just like it in every town in America. I’ve always felt that the best way to make an atheist or liberal look silly is to simply let them speak. They’ll typically do most of the work for you. 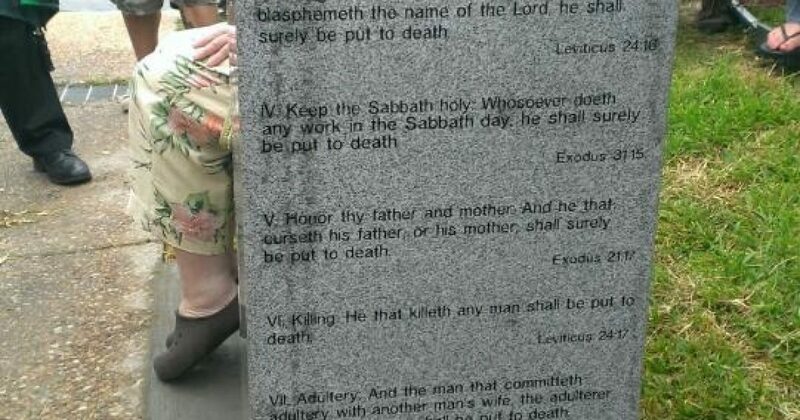 This monument in Florida perfectly encapsulates everything that’s wrong with atheist philosophy and atheist morality. Specifically, that it has no philosophy or morality. Sure, when pressed, an atheist might offer up some stripped-down secularist plagiarized version of the beatitudes, but normally atheism defines itself only by its opposition to Christianity, not by what it uniquely offers to humanity. The text engraved on the monument attacks Christianity rather than positively promoting something of its own. The most prominent feature is a pillar that offers an incorrect theological interpretation of what the Bible supposedly promotes as “punishments” for breaking the Ten Commandments. The usual quotes from Leviticus and Deuteronomy are trotted out. It’s always hilarious to watch an atheist try to build a case against Christianity by solely quoting the Old Testament — not realizing that, if anything, they’re actually attacking Judaism. Christianity is defined by the New Testament, Christ fulfilled the Old Law and completed the sacrifice made necessary by original sin. This is Christian Theology 101, and you might want to try to understand it if you wish to discredit it. You can’t understand Christianity by pulling random quotes from ancient texts written thousands of years before the Gospels. But this is all academic. The better question is this: Why, instead of offering something of your own, are you wasting space on your monument building some half baked case against a different belief system? Christian monuments tend to give answers and truths, not criticisms. Many Christian statues and tributes depict the Crucifixion, which is a symbol of love and sacrifice (I can see why that would seem offensive in today’s culture). Or else it might be a display of the nativity scene, or just as commonly, a re-creation of the Ten Commandments. The former represents family, life, and commitment, while the latter is a set of moral edicts which speak to the Natural Law — the foundation of our Western conception of justice and morality. Agree with them or not, believe in them or not, they are nonetheless steeped in history and meaning. As opposed to this atheist monument, which is a petty assortment of meaningless nitpicks and dishonest slanders. Next, the monument displays quotes from Thomas Jefferson and Benjamin Franklin. Shhhh nobody tell them that Jefferson and Franklin were Deists, not Atheists. Deists, far from secular, actually contend that God is a reality that can be attained through science and reason, rather than faith and scripture. You know what that means? It means they don’t see God as a product of religion or a matter solely for the Church. You know what that means? It means when Jefferson spoke of separation of Church and State, he certainly wasn’t advocating removing God from State because he believed God to be an Absolute Reality, rather than a belief resting on faith. Deists know that you can’t remove God from anything, anymore than you can remove the wetness from water. should be built instead of a church. be done instead of prayer said. and not escape into death. Again, they’ve decided to immortalized their defensiveness and dishonesty. Interesting strategy. First of all, where, precisely, are the atheists building hospitals and conquering disease and poverty? Where are their magnanimous deeds? If I go to the gutters of Guatemala, Ethiopia, or Calcutta will I find hundreds of atheists serving the hungry and clothing the naked? If I am a poor Muslim villager in Albania, can I ride my pack mule to the atheist organization down the road to get free antibiotics for my sick daughter? No. They aren’t there. They are nowhere to be found. I’ll tell you who I will find: Christians. No group does more acts of charities or serves more people afflicted by war and poverty than Christianity. You can not find a decaying, hellish, forsaken corner of this planet that isn’t being cared for by Christians. The monks and nuns in the monasteries in Middle East offer food and free health care to their Muslim neighbors. What do they get for it? Persecution, beheadings, stonings. But they stay and they serve, just as they have for two thousand years. Search through Central Africa and East Asia, through the crime stricken, disease riddled pockets of Central and South America, and you will find Christians. You will find them serving, feeding, loving, living, dying. What sort of a pitiful, disgraceful human being could sit in the comfort of our little western fauxtopia and dismiss and deny the sacrifices of millions of Christians, all in order to win an argument? Atheists might WANT hospitals built and poverty vanquished. Christians, on the other hand, actually dive right into the thankless work of doing it. Again: No organization on planet Earth does more for the poor than the Church. You can cover your eyes all you want, but the truth is the truth is the truth. By the way, hospitals aren’t just built by Christians, and it’s not just that most hospitals are Christian institutions, but it can be said that Christianity INVENTED hospitals. Good Lord, read a book or something, people. Also read into what Christians did for the university system, science, art, medicine, technology, international law, and philosophy. It’s not the anti-Christianity that bothers me, it’s the anti-intellectual, history denying idiocy that really grates on me. So build your monument, with all the ignorance and lunacy you can muster. Immortalize it. Memorialize it. Put it on display. Let everyone see it. I couldn’t be happier. Thank you, Atheists.